The UN has announced that more than half of Syria’s people have now been killed or fled their homes in the 41-month conflict. The UN High Commission for Refugees said the number of Syrian refugees has now passed 3 million, with another 6.5 million displaced inside the country. Last week the UN conservatively put the verified death toll at 191,000. It said another 50,000 people had been killed, but details of their names and locations were still outstanding. [Refugees] are arriving in a shocking state, exhausted, scared and with their savings depleted. Most have been on the run for a year or more, fleeing from village to village before taking the final decision to leave. 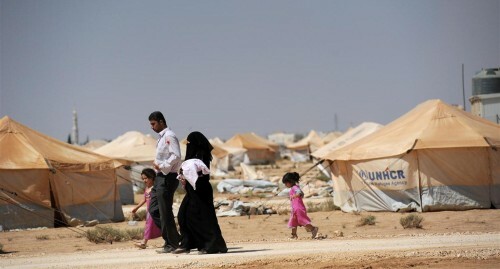 Lebanon now has 1.14 million registered refugees, Jordan 608,000, and Turkey 815,000. Those governments estimate that hundreds of thousands more are in the countries but unregistered. Donors have given more than $4.1 billion in assistance, but more than $2 billion more is needed by the end of 2014, the UN said. More than 80% of the refugees are struggling to make a living in communities outside of camps, and more than a third are living in substandard shelters, the U.N. said. Syrian forces tried earlier this week to push out insurgents with troops and armored vehicles, but at least 100 soldiers were killed and several tanks and other armored vehicles were destroyed. More than 70 UN peacekeeping troops have escaped a siege by gunmen in Syria’s Golan Heights near the demilitarized zone with Israel. The two groups of Filipinos peacekeepers had been surrounded, after another detachment of 44 Fijian troops were detained by the attackers earlier this week. The Philippines Defense Minister, Voltaire Gazmain, said on Saturday that the gunmen had fired on one of the two groups. There were no casualties. Insurgents have been taking territory in the area, including Quneitra city and the Assad regime’s last border crossing with the demilitarized zone, overseen by UN peacekeepers since 1974. The UN said on Saturday that it was told the detained Fijians were in no danger and had been taken “for their own safety”. A claimed statement from the Islamist faction Jabhat al-Nusra on Saturday night said the troops had been seized because of the actions of the UN. It said the international organization had not moved against the Assad regime’s war crimes and was under the control of powers who wanted to humiliate Muslims. Other insurgents claim that the UN forces safeguarded Syrian officers and troops who were fleeing the insurgent advance and allowed the regime forces to attack the insurgents from a buffer zone. The statement assured that the captives are safe and in good health, provided with everything they need as Islam has taught Jabhat al-Nusra to treat prisoners well.